Today we are going to create a special treat on Thirsty Thursdays. : Last time we had a meet up for the members of our Namaste Yoga Membership Site at Fresh on Bloor downtown Toronto I ordered a beet root frappe which had apples, beets, carrot, ginger and nutmeg. 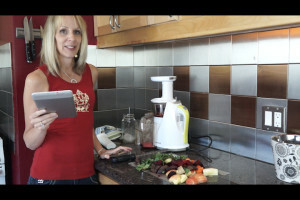 I had juiced apples, beets, carrots and ginger before, but I had never grated nutmeg over top and it was delicious!!!! 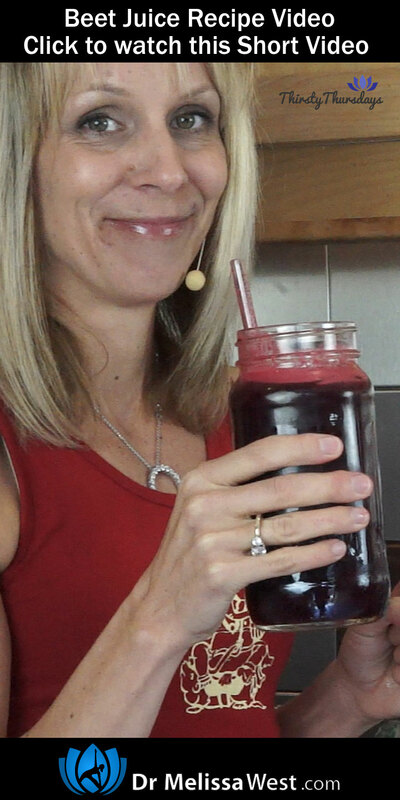 Juicing beets is incredibly beneficial. I think beets are best known for their promotion of liver health. It is the high content of the antioxidant betaine in beets that stimulates the liver cells to clear out toxins. Betaine also protects the cells of the liver, gallbladder and the bile duct from oxidative damage. My Naturopathic Doctor, Jonathan Beatty has recommended that I juice 250 ml of beets a day to help dilate my veins and improve blood flow to help prevent migraines. You can juice the root, stems, and leaves. Carrots are high in vitamin A which helps to improve your vision and skin. The carotenoids in carrots also help to lower your risk of heart disease. You can juice the carrots but not the greens as they contain substances that act as a toxin in the body. Apples are such a great ingredient for juicing because of their high yield and sweet flavour. They are also nutritious with folic acid, beta-carotene, Vitamin C, and magnesium. Apples can help to prevent heart disease, improve your liver function and cleanse your digestive tract. Ginger is one of my favourite juicing ingredients. I love it for its anti-inflammatory qualities. Ginger has more than 12 different anti-oxidants which help prevent many different diseases from cancer to alzheimer’s. Ginger helps to prevent colds and improves digestion. Nutmeg reduces anxiety, treats insomnia, can calm muscle spasms. It helps with nausea, vomiting, diarrhea and indigestion. Nutmeg is also beneficial for joint pain and gout. It is said to be good for lowering blood pressure, improving concentration, increasing circulation and lowering cholesterol.